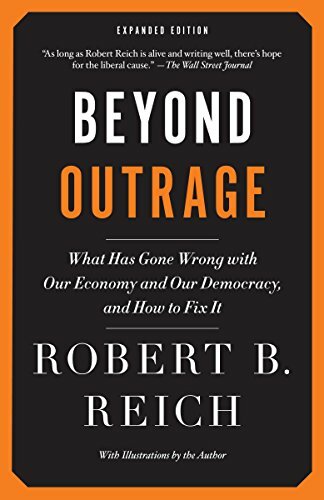 While Robert Reich’s essay Beyond Outrage is a rant, applying the Johnsonian definition to it is as unfair as it would be to call it Nietzchean, which the title suggests. One might say that, under the circumstances, Mr. Reich has the right to a rant of Nietzchean proportions. After all, the radical Right does nothing but rant about values, freedom, choices, and all sorts of abstractions which have proven to provide enormous political appeal in determining national policy for fiscal, educational, and even defense matters. The Dems, of whom Mr. Reich is one, haven’t been able to come up with anything as catchy, although their actual policy proposals have had a lot more meat on them. So it only seems fair that Mr. Reich should try to come back at the Tea Party on the “bread and circuses” side of politics with this very readable rant, one that at least reminds the reader that the Dems are on the side of the poor, the working man, and the middle class (at least in this battle). It also is only fair to say that author Reich makes his case—albeit while cutting so many corners, that the careful reader finds himself or herself saying: “But, but, but, but . . .” out loud while reading it. Mr. Reich’s demonstration of the extent to which our political system has been corrupted by wealth is powerful and convincing. And he offers the reader a way forward that is believable. Here is Mr. Reich at his best: “With so much of the nation’s income and wealth at the top, tax rates on top earners and corporations dropping, and most workers’ wages stalling or declining, tax revenues at all levels of government have fallen precipitously. This has led to a major squeeze on government budgets. That’s Mr. Reich’s argument in a nutshell, and who can deny any of it? The very top percentiles of the rich in the U.S. (and elsewhere) have earned far more than the rest of us, and they’ve paid far less in taxes. Let’s look at some reasonably objective sources. According to the nonpartisan Tax Foundation, those who earned the top 1 percent of income—that is, the highest level possible—paid about 37 percent of total income tax in the US (last statistics from 2009). The top 50 percent (which includes the top 1 percent) paid about 90 percent of all income tax. So it is indeed true that the top earners pay less in income tax than do the rest of us, except those at the lower rungs of the earnings ladder. As Mr. Reich points out, the top earners then take their money and sometimes lend it to the country in the form of Treasury bond purchases, and they pay only capital gains tax at 15 percent on those earnings. In the financial services boom that lasted from about 2002 to 2007, vast sums were earned on investments not just in Treasuries, but also in private equity, stocks, derivatives, etc. If the investments were made out of the country, through special vehicles, etc., no tax may have been owed to the U.S. government on these investments. Corporates, also, make a relatively small contribution to the Treasury via income tax—lots of deductions, as the Tax Foundation points out. This explains why another nonpartisan source, the Organization for Economic Co-operation and Development, says that the U.S. needs to raise taxes. (Remember, the OECD applies the same criteria to taxes in Sudan or Switzerland that it does to the US): ”While raising taxes necessarily distorts activity and therefore imposes a cost, there would nevertheless appear to be more scope for tax increases in the U.S.—the United States tax-to-GDP ratio is among the lowest in the OECD area, even including taxes at the levels of state and municipalities.” (From the OECD United States Economic Survey for 2010). This is quite close to what Reagan did in 1981. Did it work? Sort of, but the big problem in the Reagan years was inflation. That got under control, but that’s not the problem in an economy that will, if we’re lucky, see 2 percent growth in the second quarter. Real GDP didn’t increase much at all under Reaganomics. Productivity increased remarkably, but productivity has already increased sharply during the recession as companies “got lean and mean,” as the saying goes, and the unemployment rate spiraled (I cite William A. Niskanen’s article on “Reaganomics” in The Concise Encyclopedia of Economics). So Reich makes a very good point when he says that the rich will just get richer, under Romney-Reaganomics, and the poor will get poorer. The rich don’t need the tax cuts, because neither the wealthy nor the corporates pay much in taxes anyway. The increase to the average working man’s income will be small, because, earning little, he doesn’t pay large sums in taxes. It is really hard to see how the Republican program can possibly make sense. Its motivation, as Mr. Reich shows in a well researched chapter of his book, does seem to go back to the Social Darwinism of the 19th century, although, to this writer, it also has sources in the British class system. for the United States.” There would be various ways to do this, but issuing vouchers to seniors on Medicare that will be worth less and less as time goes on, while passing insurance to the more expensive private sector, doesn’t seem a likely way to go about it. The Republican approach to education also seems to hark back to the Victorians: Cut out all federal interference in our schools, and give us all vouchers so we can go to whatever schools we wish to. It is true that the U.S. education system is based on the township. Only very late in its history did even the state, and eventually the federal government, get involved. According to the Republicans, this should create a kind of High School Musical experience for everyone, in which the rich people and the poor people all sing together. Time for My American Experience. This writer grew up in the Township of Hempstead, on Long Island (yes, totally up-Island, you snob). The local public school, run by the Township, was quite good. When we were in second grade, the school was one of the first integrated under Brown v. Board of Education. My relatively affluent parents whisked me right outa there into private school, and so did all the affluent and relatively affluent people in the entire township. Eventually, they got some sort of tax credit to compensate them as well. The result: The relatively good local school went straight downhill to become one of the worst in the country—not at all because of integration, but because there was less and less money for teachers, books, sports, etc. Pardon this personal excursus, but it seems appropriate here. What will happen when all the affluent people take their vouchers and move their children to expensive private schools? Where will the money come from for the rest of the children to receive a decent education? Mr. Reich illustrates this point with some fervor. In fact, it is the consultants and the contractors who have come out ahead as the union workers and 9–5ers struggle to keep going. Because education in the U.S. has been relatively strong compared with the rest of the developed world, U.S. skilled workers are in demand. As economic growth shifts to emerging markets, our skilled consultants and contractors should be moving in there, getting a share of the business and bringing the bacon home. President Barak Obama has just proposed incentives to “keep jobs in the U.S.;” it is a great mistake (but Obama seems to have studied economics with Marshall McLuhan). You cannot protect jobs anywhere, anyhow. We need to get our companies well positioned abroad where they can sell our exports and our services, and our workers will benefit with more jobs. Yes, they will have to be more mobile, but they can bring it all back to Peoria (or 57th Street) when their shifts are over. Mr. Reich does not get this; he complains about the extended presence of our companies abroad. It is the one really wrongheaded aspect of his book—for example, he misses the vocation of the Germany economy for exports that is the basis of its success. The Democrats really need to learn to understand where the global economy is going if they are going to tap that growth. But this is only one aspect of an otherwise well-aimed emotional rant. Much more ranting on this side will be needed, as the Republicans have an easy sell—they make hay with the idea that all government is inherently bad. Perhaps Mr. Reich will be successful in provoking a larger movement, as he proposes in his last chapter, and it will help balance the scales.